Some of you might have noticed a new face along the corridors of S2 nowadays. Tall, handsome, sometimes bearded and sometimes not, this latest addition to the DBS community can commonly be found along the first floor of our block. 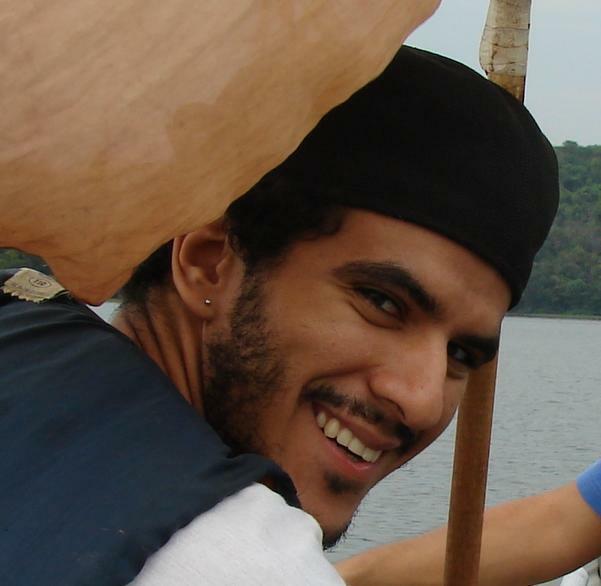 Hailing all the way from South America, Brazil, Diego Pitta de Araujo (pronounced Jhi-eh-go Pita dey Ah-ra-oo-jhou) is the new Research Assistant in the Behavioural Ecology and Sociobiology Lab. He has recently completed his Msc from the Federal University of Minas Gerais, working on jumping spiders, and is now at our sunny island to embark on a project of a more interdiscplinary nature – Nanostructures of UV colour in arthropods. So do say hi to Diego if you see him along the corridors, and feel free to introduce him to any local hangouts/foods/slang/whatever else you can think of. As Diego says: Eu amo Cingapura! (I love Singapore! ), so do make your acquaintance when you see him! Good news! Peter Todd is now the newest Assistant Professor in our group – congratulations Peter! 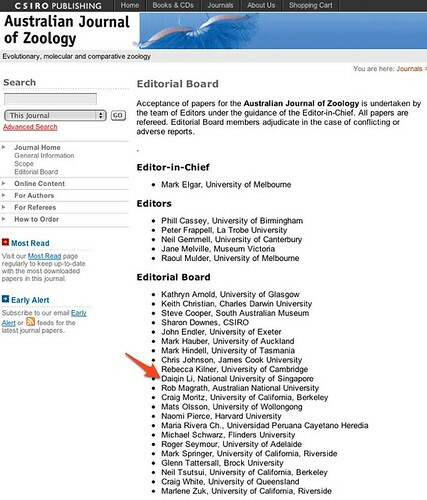 Li Daiqin has accepted the honorary appointment of Senior Fellow in the Department of Zoology, University of Melbourne. Congratulations, Daiqin! 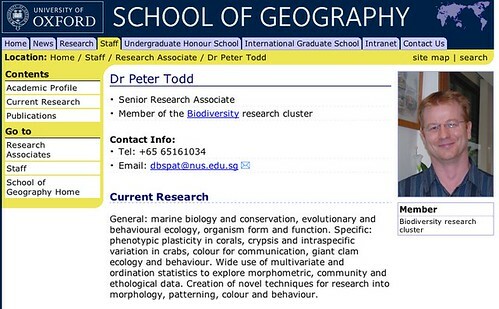 Peter Todd has been appointed a Senior Research Associate at the School of Geography, Oxford University Centre for the Environment.